After posting many photos of the places where I lived in London, it struck me that I should also show where I live now. There is only one residence to feature of course, so I have used more photos of the house. 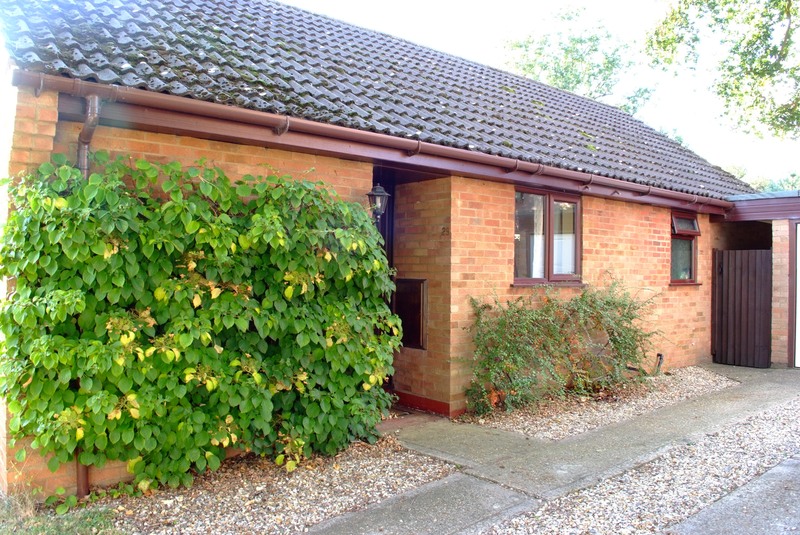 It is an unprepossessing brick-built detached bungalow, built in 1979. It was later extended at the back, in 1987. As you can see, it has a separate garage, and enough space to park three cars inside the gates. The side view shows the front door alcove, and the climbing Hydrangea. The huge Oak tree visible behind the garage is in our back garden. It is estimated to be almost 280 years old. 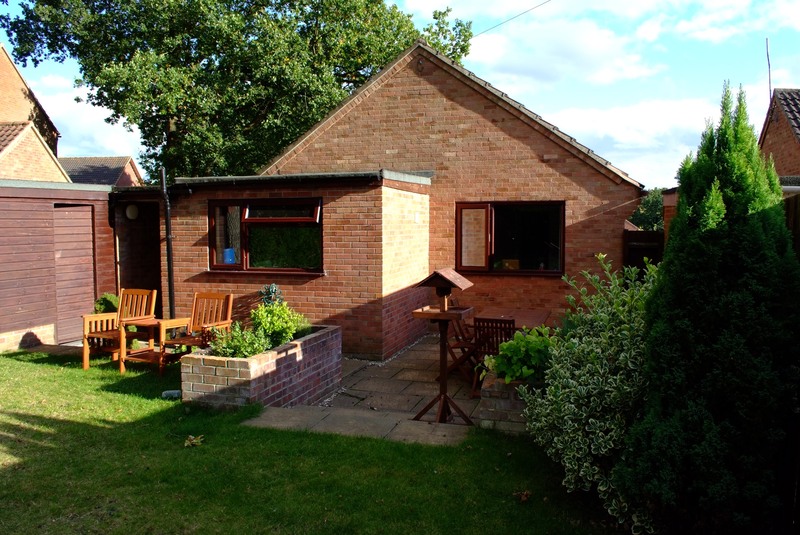 The back view shows the kitchen extension, and the garden shed built onto the garage. The garden is a manageable size, and enough for us. It is not a ‘pretty’ house. Neither is it a country cottage, or a typical village property found in similar villages all over the UK. 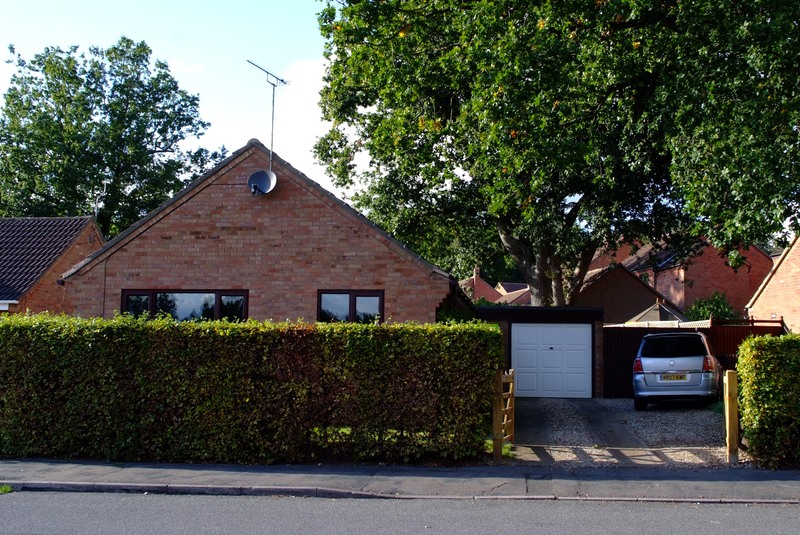 It is part of a small estate, mostly built in the 1980s. But at each end of the road there are few houses to be seen, and you are immediately in the countryside. It looks nice and solid, which is a very important quality in a house. Thanks, Abbi. It is certainly solid, and quite dull from the street. But it has useful space inside, which is the main thing, as well as good off-road parking too. And it looks very comfortable too. A real cottage in Norfolk, like seen in many films. A wonderful little garden! I love those pictures in the evening (??) sunshine. Thanks, Pit. Yes, it was early evening, in the summer. I had been gardening all day, and took the photos whilst everything looked smart! Late afternoon or early evening sunshine always makes for such a wonderful soft light. Mate you must be loaded. What a wonderful house after many years of hard work. Of course Beetley is cheaper than London. I guess I’m illustrating my own ambitions and frustrations. And trying to tell my friend that he has a nice house. 🙂 Best wishes Pete. I was just throwing around some examples of the crazy price differentials. Unless I win the lottery! It’s very nice and appears to be quite solidly built. The grounds are neatly kept, you should be very proud of it. Well, I for one think it is a ‘pretty’ house. Very pretty, indeed. The yard and view out back is quite lovely. Thank you for sharing, Pete. You are welcome, Pete. Funny how we get a picture in our head; here in New England, brick is only in the cities and the suburbs. I never thought of Beetley with brick houses. See how trained we all are in our thinking? Most people outside England think of village houses differently. It looks perfect and easier to handle than some of the old properties (that I’ve always loved the look of, but not having any maintenance or D-I-Y skills I’d never manage to keep up with). And I’ve always loved oaks. Wonderful! What nice photos. What a relaxing garden. Lovely garden and house, and especially cool to have the historic trees. BTW have you done a post on why you chose Beetley from all others? A very nice home, Pete! I truly love all the greenery and it looks very tended to, which means the owner cares. 🙂 I actually love that yard. Very nice Pete! And perfect for a comfortable retirement! Mine too – not too big. Big enough for me and occasional visits from family and friends. Besties. I think it’s a very nice house, Pete. I like brick. When I was in high school, back in the Midwest, we had some brick on the front of our house. Out here in Las Vegas, homes are mostly stucco painted in light desert tones, and few people have a back yard worth writing home about. (Huh?) …Anyway, unless you have tons of money, you’ll end up with an exceedingly boring cookie cutter home. Thanks, David. Brick is the norm here of course, so seems ‘usual’ to us. You have a lovely home Pete. I was hoping you’ll feature the interior of the house too. You have a large garden. I doubt I would show interior photos, unless I had something specific to feature. I think it’s a lovely home, Pete. Thanks for sharing. It’s great to have such a fine old tree nearby! That’s one impressive oak tree Pete. And a lovely neat little house and garden. Thanks, Jude. I think the house is dull to look at, but it is well laid out inside. And although we don’t have many flowers, the garden is pleasant enough. I have enjoyed the home tours and I think you have a very nice place to call home. an impression of where and how the three of you live in Beetley. It makes a difference, it’s almost like an invitation to your home and well done to you for doing so, Pete. It looks very well-kept and the tidy drive puts a smile on our faces; thanks to your recommendation, we also have this awesome weed-puller. Management is beautiful-My place has outgrown me and I am trying to downsize! Wish me luck! Well Godspeed in that endeavor-My quest has been a nightmare thus far! haha! It’s not us downsizing. 🙂 Just seems to be everyone else around us. Try this post again. You have seen it before, but it will remind you. What you see is all of it, plus the houses of course..
That looks lovely. A perfect home for this time in your lives. Exactly, Elizabeth. No stairs, a low roof and windows, and easy to navigate. That would make a great ad. Pete tell me if I’m out order and that’s fine, but is displaying your car number plate a good idea! I had someone contact a member of my family all because without thinking I wrote just one fact about myself I thought at the time inconsequential, just one fact within 200 posts, incredible! Then quite incredibly this person tracked the family member down (I shan’t say how but it was a street address). I’m still in shock to this day, luckily this happened May and we’ve heard no more but it seems some people enjoy internet detective work! Perhaps they get a kick out of piecing bits of information completing into a picture similar to doing a jigsaw. Who know. A blog friend Andrew 🙂 . A valid point Andrew. And I had a similar thought until I realised that it would be pretty easy to track Pete down since we all know he lives in Beetley, wears shorts most of the year and has a unique dog – can’t be many of those around! If any of your neighbours read your fiction Pete they’d be moving! I was being tongue-in-cheek there, referring to your ahem, ‘perfect murder’ story. But you must be relieved that those particular real neighbours have moved. Hope you get a nice quiet retired couple. Thanks for the thought, Andrew. To be honest, most people in Beetley know where I live, and are familiar with my car too. if someone from my past wants to do me harm, then I am easy enough to find online, on Twitter, Amazon reviews, Google+, Linkedin, WordPress, and many Google searches too. I am the only person with that name in Beetley, and there are less than 1300 residents to choose from. Plus, I have a dog that is unique to the area, and everyone sees me walking it, all over the place. If a random stranger decides to target me, then there’s not much I can do about that. I have no money to speak of, nothing to steal, and as a rule I don’t tell people I am away anywhere, until I come back. I sort-of refuse to be scared about such things, though I know they exist. 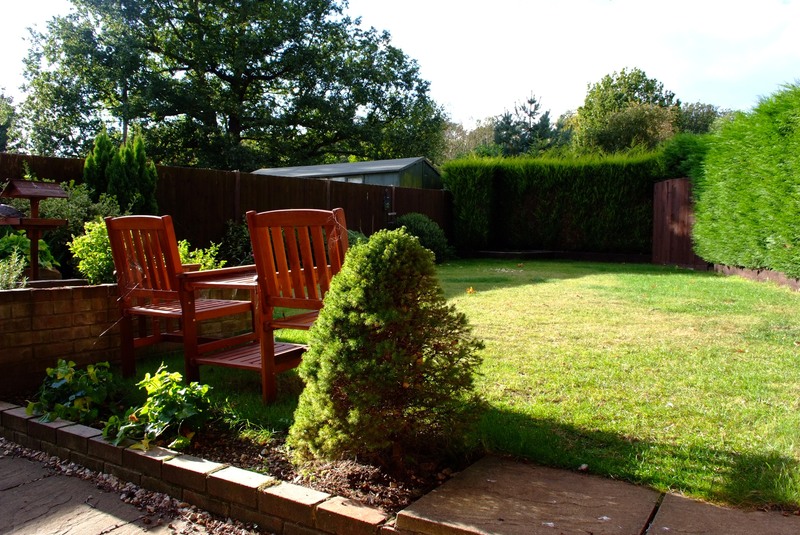 Looks terrific Pete and plenty of room to relax outside in the sun! lovely home you have Pete. Lovely. Looks like there is plenty of space for Ollie to run around on outside too.